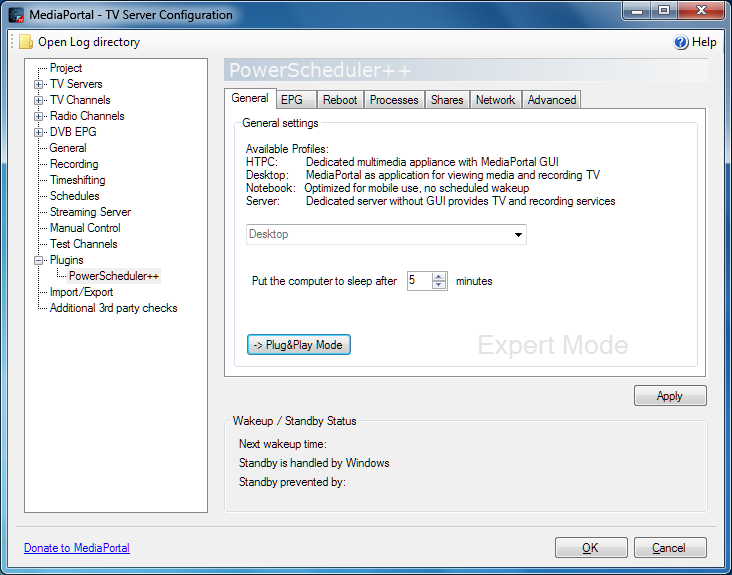 NOTE: PowerScheduler++ is integrated in MediaPortal 1.5 and higher, so you don't need to install it for current MP versions. 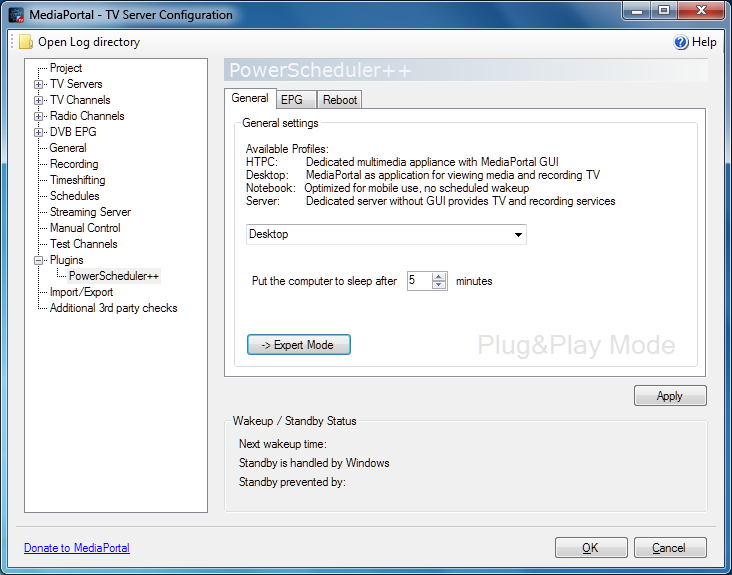 In Plug&Play Mode all you have to do is to choose one of the four system profiles (HTPC, Desktop, Notebook, Server - the one fitting best is preselected) and set the desired sleep timeout. 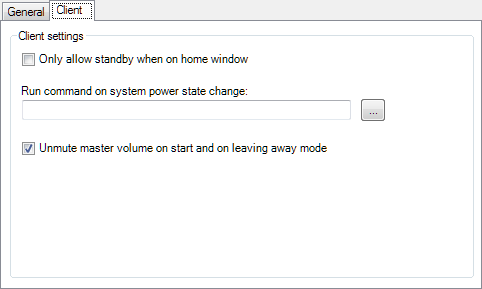 Everything else - including the Windows power options - is set automatically to some reasonable values by PowerScheduler++. In Expert Mode all options are available for the experienced user. You can use the Expert Mode to see in detail, what the Plug&Play Mode would configure and change it, if required. 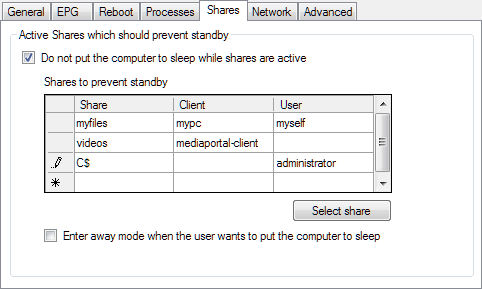 Reboot, Network, Processes and Active Shares standby / wakeup settings are available also for standalone clients. For the users experiencing problems with audio mute after wakeup or return from "Away mode" PowerScheduler++ now unmutes audio automatically if necessary. 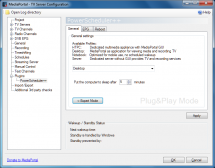 Beginning with MediaPortal 1.5 PowerScheduler++ is integrated into MediaPortal. The last PowerScheduler++ versions 1.4.0.x are designed for MediaPortal 1.4. For even older versions of MP you can download the PowerScheduler++ versions 1.3.0.2 (for MP 1.3) and 1.2.3.7 (for MP 1.2.x) from the Archived files. For more information see the PowerScheduler++ Wiki Page or visit the PowerScheduler++ Forum Thread. I just managed to let this wonderful plugin turn my TV and AMP on and off only when it should, thus at user interaction. When the singleseat is started by a remote client no TV or AMP has to turn on. I managed this by using a batchfile which parses the 'suspend' 'resume' 'awaymode' and 'onrun' arguments. These will trigger a IRSS macro which blasts IR code. Soon I will post this solution somewhere one the forum, because I think there are more people using a similair setup. I am happpy that you love the PS++ plugin, but I do not want to get money for it.  So I would ask you to give your donation to the MediaPortal team. Love Powerscheduler++. 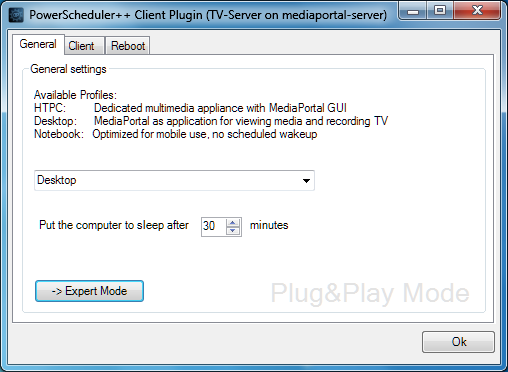 It's very, very reliable and stable and has never missed a beat in wake ups for recordings or EPG grabbings. 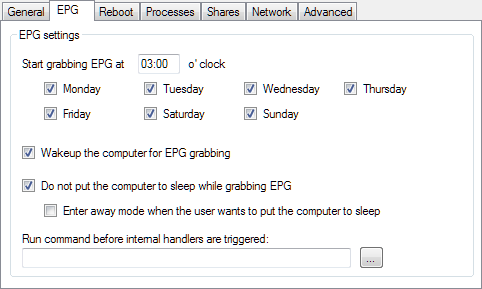 But, as eduard94 reports below, the latest version no longer allows a customized pre-wakeup time. 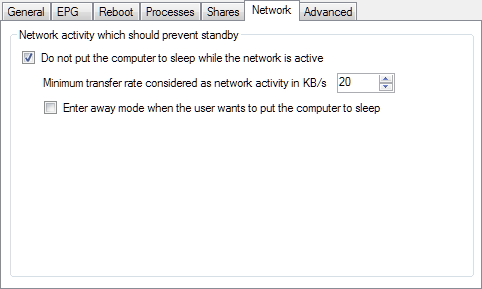 Unfortunately, it takes my cable STB more than 60 seconds to initalize, so I had to revert back to 1.2.2.1 to provide the longer pre-wakeup time. 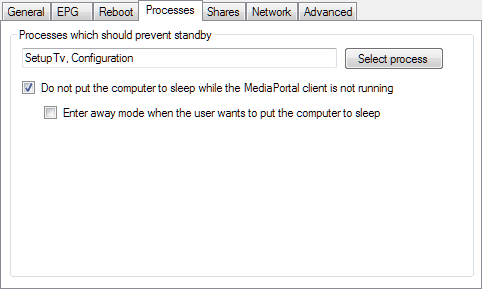 Sure wish michael_t would consider restoring this adjustment in updates as it is very useful in situations requiring additional pre-wakeup time. 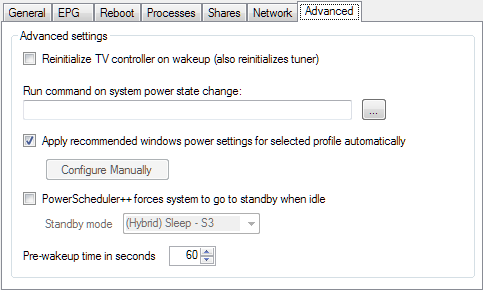 Very good plugin, but in new version I can't find pre-wake up. It very useful function. 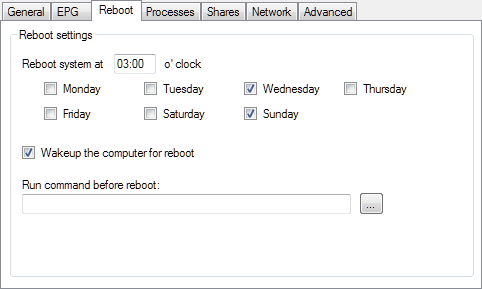 The function is still there, but no longer configurable - the prewakeup time is fixed to 60 seconds. A must have plugin for all concerned by powerconsumption. 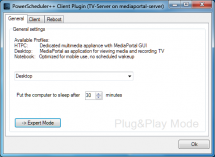 With this plugin my HTPC wakes up and hibernates like clockwork and even stays on during downloads and then hibernates when done. The first version I tested did not work well, the 100% CPU problem but a day later a new version was out. I have MP on a dedicated PC, before this I had to leave it on 24/7, very expensive as the PC was quite high spec to cope with HD. Now when it is not being used it hibernates - so even the background hum of the disks has gone - so quieter too! I turn it on and it works, leave it on the home screen and ignore it - it will hibernate and wake up for recordings as necessary. This MAKES MP a much more power and noise friendly piece of living room furniture. Dieses Plugin hat mich viele Nerven gekostet. Zwei HTPCs hatten dies installiert und beide hatten aller zwei Wochen DB Schäden nachdem sie aus dem Standby kamen - das MP hängt sich permanent auf. Ich habe jetzt beide HTPCs mit der integrierten Lösung laufen - geht besser als vorher. Irgendwie sind beide Lösungen nicht ganz gut.